Although ankle boots might be way more popular than any other styles and lengths this winter, there’s still plenty of room in our wardrobes for a good pair of knee high boots. For a start they keep us so much warmer, which is a really important consideration when you have to deal with miserable British weather everyday, and they’re a great way to dress up an otherwise casual outfit too. In this round-up we’ve collected together our favourite 13 budget knee high boots for the chilly winter months. We’ve brought you flat boots that are all about comfort through to super sleek, heeled boots to smarten up your favourite sweater dress and everything in between. 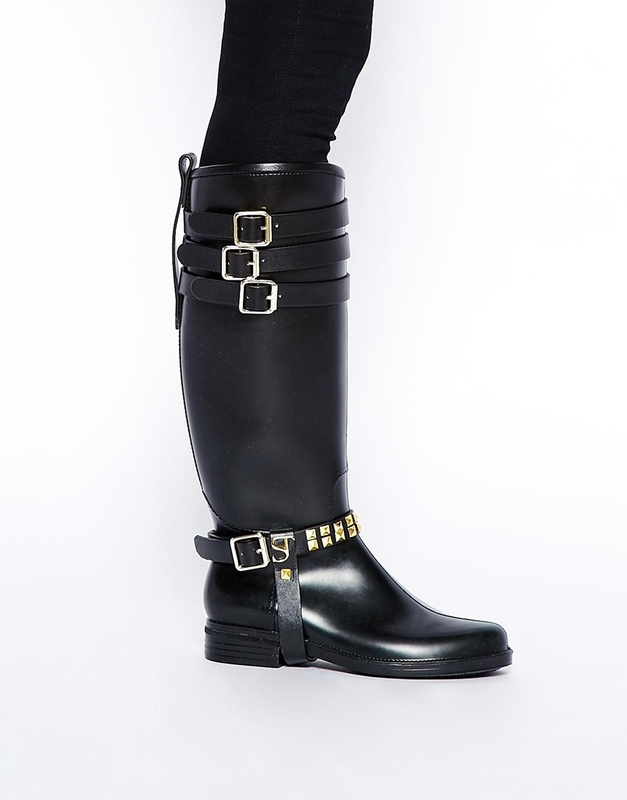 These boots from Miss KG are really versatile for the winter because they’ve got a 3.5cm block heel and a shiny, patent-look, which means they can easily transition from day to night. 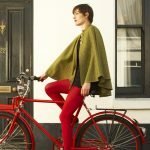 We’d team them up with chunky knit tights and a sweater dress over the Christmas fortnight. Grab yourself a pair from John Lewis for £69. Another pair of boots from New Look (but sold through ASOS) with a simple black leather upper that’ll do for all occasions. We like the fact that these have a long zipper all the way down the side, it makes them look a bit edgier and will mean they’re way easier to pull off when you’ve squeezed your thick winter socks out of them! The Emily boots are available from ASOS for £59.99. These leather boots from ASOS may be called ‘cold shoulder’, but we think that’s because they’re guaranteed to keep your legs nice and toasty this winter. Ideal for work, because they’re basic and black, and ideal for weekends, because they’ve got a teeny tiny heel and will go with anything. If you’re looking for a versatile and understated pair of black boots this winter, then these are the ones you should go for! Get your hands on them at ASOS for £75. If you’re looking for a pair of brown boots this season you’ll find it tough because black ones seem to be all in right now. But fear not, Boohoo has your back. This simple buckled pair with a perfect-sized heel are currently on sale for £35. Snap them up soon! The Rena boots are available from Boohoo for £35. Part of New Look’s great ‘wide fit’ range, these boots have just enough heel and detail to wear on a night, but are also totally subtle enough to team up with more formal outfits for work. 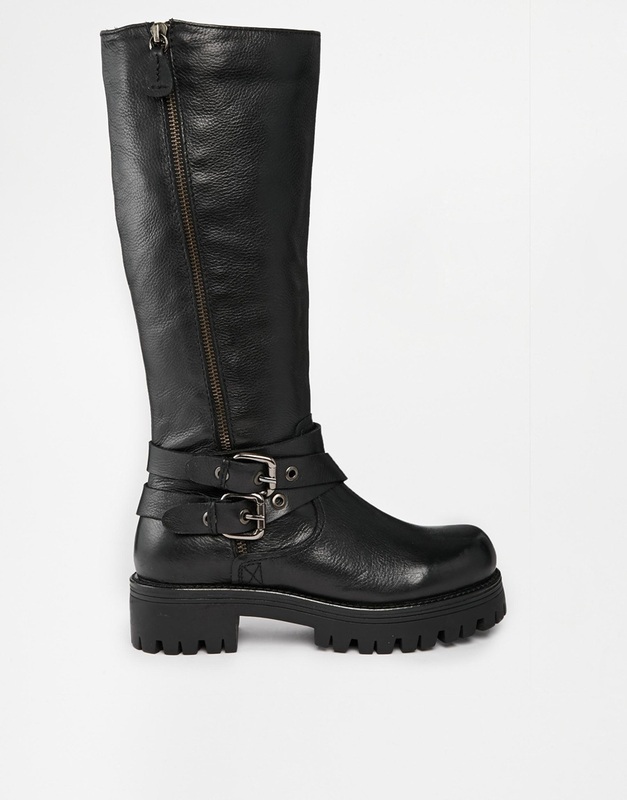 We particularly love the padded, biker-esque detail running down the back, which makes this pair stand out in a sea of basic black boots. Available from New Look for £26. These soft touch boots by River Island have a suede effect finish and slight gold chain detail along the front. 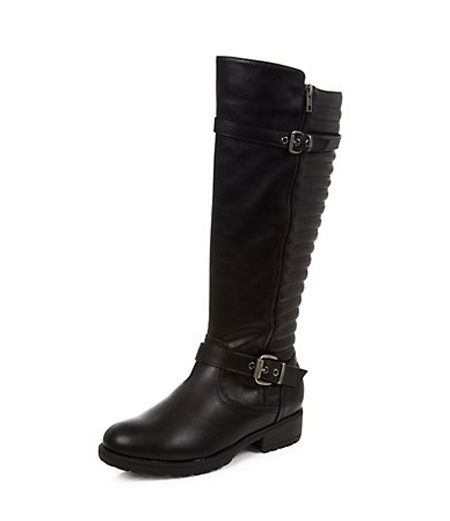 They’re slightly higher at the front over-the-knee, which always tends to make boots look a little more dressy – pair that with the fact these have got a small heel and they’re a great pair to transition from day into night. Available from ASOS for £60. 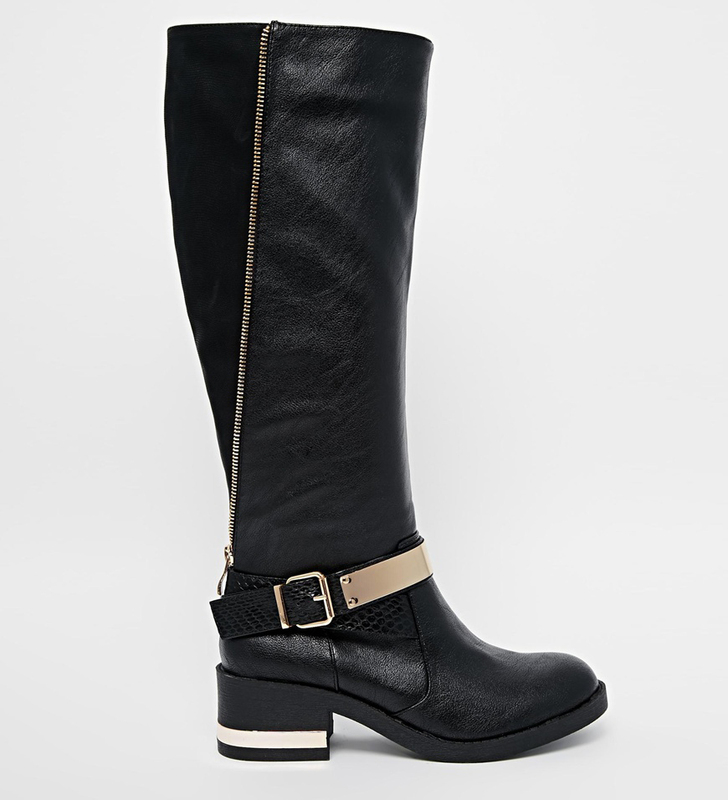 These sleek boots are great for wearing underneath jeans or trousers, but also look very good and silhouette-hugging when paired with tights and a dress. If you’re feeling daring these boots also come in a dusky burgundy shade, but be warned that they’d be much harder to keep clean! These velvet-y boots are available from John Lewis for £47. 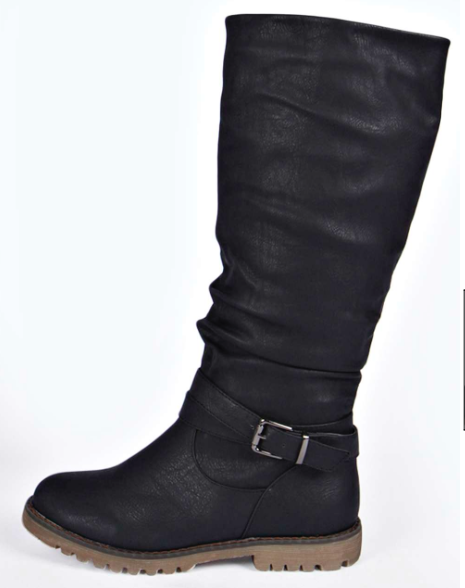 If you like your boots much chunkier with a decent heel, then this New Look pair from ASOS is ideal. They’ve got a leather-look (but not actual leather at this price, sorry!) upper with a rubber-y wedge-like heel that’s bound to be much comfier than a pair of sky-high heels. They’re great for those who want a shoe for nights out but want to stay as warm and comfy as possible. Available from ASOS for £39.99. If you like your boots to have a slightly chunkier heel over winter when the ground is wet and gross, then these slightly more rugged boots from Boohoo are ideal. Granted they probably won’t fare too well in deep puddles or snow, but they’ll provide your feet with a little more comfort and protection when the weather is bad. 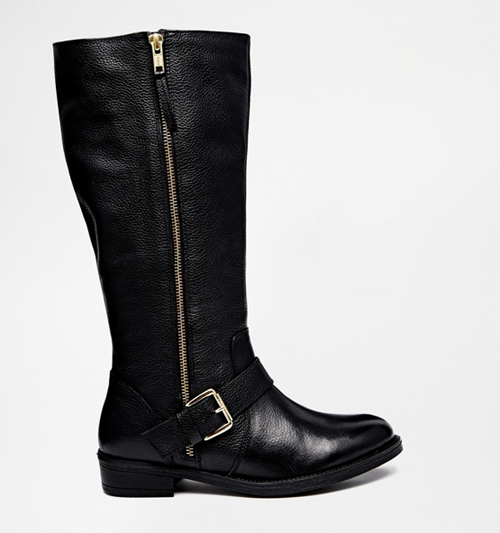 If you like your boots to have a little bit more bling and detail, then these riding boots from River Island are for you. They’ve got a gold plated strap around the front, a velvet-y finish at the black and a faux-snakeskin strap. You can get your hands on these boots from ASOS for £65. If you’re looking for a more formal boot then this pair from Boohoo are great because they have a mixture of shiny faux-leather and soft faux-velvet with a pretty decent 3.25″ heel. Depending on your height they’ll probably just cover up your knee at the front, so hear that in mind if you plan on wearing jeans or leggings under them, probably best to reserve these for tight-covered pins. Available from Boohoo for £35. 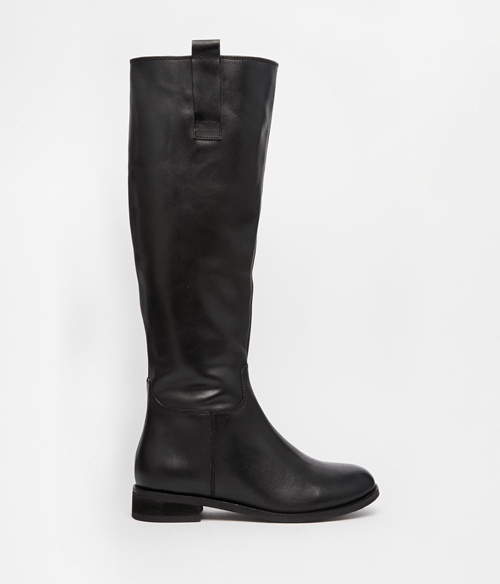 If you’re conscious of your new boots getting all wet and soggy when it rains then try out these wellingtons from Supertrash. They look pretty similar to regular knee highs but they’re guaranteed to withstand everything the UK weather has to throw at them. You can grab these wellies from ASOS for £63. We love these super chunky knee high boots from Park Lane because they’re full of attitude with their cleated, no-nonsense soles and big buckles. 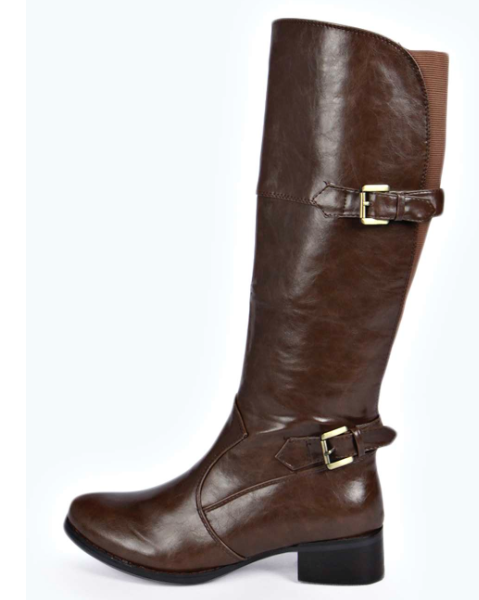 They’re real leather too, so will keep you warm and dry this winter – if you protect them well that is! You can get your hands on these chunky boots from ASOS for £67.50.